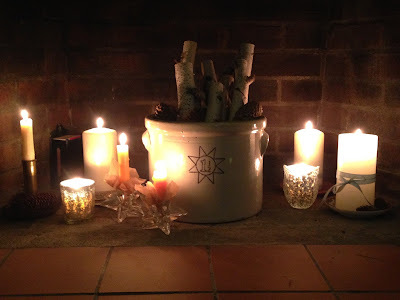 The winter solstice is a quiet celebration in our home. It is a cherished moment of time spent together as a family with limited external distractions. Also known as the hibernal solstice, an astronomical phenomenon marking the day with the shortest period of daylight, and the longest night of the year. The return of the light and the flower that blooms in winter are powerful symbols of the winter solstice, the moment when darkness begins to recede and the days gradually lengthen with the promise of spring. It is a day and night to honor the importance of deep rest before the reawakening of nature. With the larger holiday of thanksgiving past, and the extended Christmas traditions just a week away, we have one dark night to honor our treasured gifts of health, happiness and home. It is on purpose that we not use any electricity, except for the heating of our meal on the gas stove. No lights are switched on, no television, and no computer screens are turned on. Usually, we spend the day in nature, going for a hike, exploring or seeking out new experiences. This year, the winter solstice falls on a weekday, so our morning time will be separate due to school and work. We will reconnect in the afternoon, and settle into the comfort of our home. As part of our daily routines, we have been enjoying time breathing, holding hands, and anchoring our minds into the present moment. It is a good way to bring balance to the start of the day, and a grounding energy toward the end of the day. Our arrival to home is a series of prioritized events, we hang up coats, backpacks, take off our shoes, wash hands, and eat a snack. We complete homework, and have free time to play. Snuggling, squirming and silliness eventually settle in, and in an effort to distract from battles, pestering, and "I'm bored" statements, I gently lay out my yoga mat, and start a slow movement practice. In my experience, if I start a yoga flow in the middle of the most popular room in the house, there is always a little face ready to meet my gaze and practice with me. Eventually, they both find their way under my legs and on my yoga mat. Breathing and moving together directs all attention to the present moment. Child pose with a little one sitting on your lower hips, and gently pressing down is a welcome release after any stressful day. Sun salutations warm up the body, make space for the breath, lengthen and extend the spine, and bring a hopeful flow of energy into our home. Imagining new yoga poses with funny names, brings a lively animated expression to this constant evolving practice of yoga. Once we are loosened up, partner poses are a powerful way to connect the focus of our minds and the strength of our bodies, working together towards a common goal. In the few hours of light left before the evening falls, we sit at the table, play cards, connect over a board game, gather art supplies to paint, draw, or write, and be together in a creative space. In our home, we usually listen to music, but on this day of consciously conserving electricity, we can make music. Singing songs, clapping rhythms with our hands or on a drum, strumming chords on the guitar, holding a space where everyone feels free and happy. In these short winter days, taking the time to express ourselves through music, pictures, play, poems, or stories is a symbol of slowing down, making memories, finding stillness as a family, holding on to one another a little bit longer. As the sun begins to set on the darkest night of the year, we light our best candles in all shapes and sizes, and enjoy the shadows the light flickers on the walls. The quiet and the dark are more pronounced, and everything seems to move at a slower pace as the stillness floats in. Supper is a simple meal of homemade soup and bread, prepared ahead of time, and we dine by candlelight. While talking around the table, each one of us attains much deserved attention, sharing thoughts, experiences and reflections from the day. In an effort to maintain respect in listening, and kindness in our words, we pass a small object around, taking turns speaking. Our object is a small pig with a movable head, arms and legs. We pass the pig around, and many animal jokes are made, as the conversation shifts, it always comes back around to heckling our cute mobile pig. "What does the pig say to the cow?" "oink, moo, oink, moo, oink, moo!" After dinner everyone picks out a book, and we read the stories aloud. We sip on honey tea as the hour gets later, and the night begins to shine. Eventually, pajamas are on, teeth are brushed, and little boys are tucked into their warm and cozy beds. Sleep finds its way into tired bodies, and the soft, rhythmic sounds of their breathing bring a deep sense of peace and rest into our home. This is our sacred holiday of love, our special ritual of simplicity and sincerity. In the midst of festive chaos, we appreciate the subtler changes of the seasons. The Solstice marks a time of remembrance, a moment of pause, silence and inner reflection. Spending quality quiet time together rejoicing in the shortest day and one long, dark night solidifies our bond as a family. Acknowledging our truest and most humble possessions, the gratitude goes deep. We are never alone, we can navigate the turbulent times of darkness with hope and humility, knowing help and support are close by. Adequate rest and healthy sleep rekindles our hearts and minds. When we wake up in the morning and the sun shines through our windows, it is a reminder that no matter how dark a night may be, the light will always return. However you and your loved ones celebrate this last month of the year, I hope it is filled with moments of quiet stillness, peace, comfort, and joy. Excellent information.thank you very much for sharing this amazing post. keep it up.